We’re deep into the holiday season, and nothing gives me pause as much as my fellow FOTer Laurie Ruettimann’s recent post on the perils of the office holiday party. It’s a personal, no-holds-barred view of such annual get-togethers, and I pretty much agree with her sober words of warning. Yes, it’s always dangerous when you mix alcohol, co-workers, and a gathering where people are encouraged to loosen up and be themselves. All too often, the employee meltdowns at such gatherings are more amusing than the event itself, and that’s because free-flowing alcohol mixed with workplace dynamics is a pretty dangerous combination. A small holiday lunch beats a big seasonal party. Many HR leaders and pros don’t feel it’s appropriate for a company to have a party and provide alcohol. I get it. I’m good either way, you have to know your culture and what they want and be willing to set limits. Kill the large holiday party and instead get your co-workers to attend a small, intimate annual holiday lunch. I was introduced to the Christmas holiday lunch over 20 years ago while working at a large newspaper here in Southern California. The managing editor took all the senior editors and section heads out to a lunch about 10 days before Christmas, and the end result was a much smaller group sharing great food, a little alcohol, and much more meaningful conversation. It was a GREAT get-together free of the drunken drama that seems to be part and parcel of most large office holiday parties. And, it made such an impression on everyone that all who attended talked about it for months afterward. Important elements for staging a holiday lunch. Try to hold it early in December — the earlier, the better. Getting some distance from the busyness that seems to accompany the last two weeks of the year is essential. Keep the group relatively small and intimate — 15 people or less is optimal. A nice long lunch is the best way to go, but an early evening dinner works too. It helps to make it be something that gets people out of work for a good chunk of the day. Invite those who work for you, or in partnership with you, and that you have a close working relationship with. When I was a newspaper editor in Montana and Hawaii, I invited all my senior editors and managers. When I was Editorial Director at a magazine company, I invited all the various magazine editors and department heads (like the art director) who reported to me. Everyone LOVED the concept. Spouses and significant others are great to invite to evening events, but they also dramatically change the dynamic among your co-workers. That’s why I always prefer holding such an event at lunch and limiting it to a small group of your key people you work with. Focus on the essential elements for a great office get together: Great food, good conversation, and alcohol in moderate proportions. A better way to feel the spirit of the season. 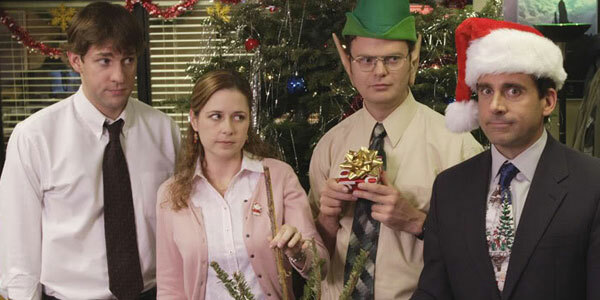 As I think back to a lifetime of workplace holiday events, the large after-work parties resonate — but only for the alcohol-driven meltdowns that invariably happened and that we have all come to expect when a large group of your workplace colleagues get together in a no-holds-barred environment. What stays with me more, however, are the intimate holiday lunches where my managers felt compelled to get dressed up and celebrate another year of working together with a celebration that allowed for true camaraderie to flourish among the people I counted on the most throughout the year. Yes, big holiday parties are fine, but for my money, it’s the small and intimate holiday lunch that lets you truly celebrate with your workplace colleagues without having to worry about all the potentially negative issues that Laurie and Tim so rightly pointed out. Perhaps it’s too late for you to do a luncheon this year, but whenever you do one, you’ll find that it not only lets you spend time celebrating in a special way with your co-workers, but it really leaves you feeling the spirit of the season too. In my book, that’s what the holidays are all about.